Nicolas Poussin, Landscape with a Calm (c 1651), oil on canvas, 97 x 131 cm, J. Paul Getty Museum, Los Angeles. Digital image courtesy of the Getty's Open Content Program. 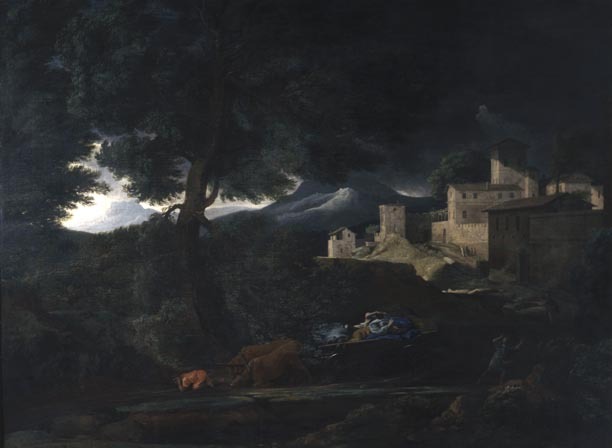 A serene landscape set under a fair sky with broken clouds, sunlight falling from behind the left of the viewer. In the foreground a shepherd, leaning on his crook with his dog beside him, tends a small flock of goats scattered beside a path which winds down to a large lake, which crosses most of the picture. On the left a large tree with dense foliage frames the view in repoussoir. It is balanced on the right by a pair of younger trees also in full leaf. At the left, the lake terminates with a low bank, behind which are outbuildings with a wall and tower. 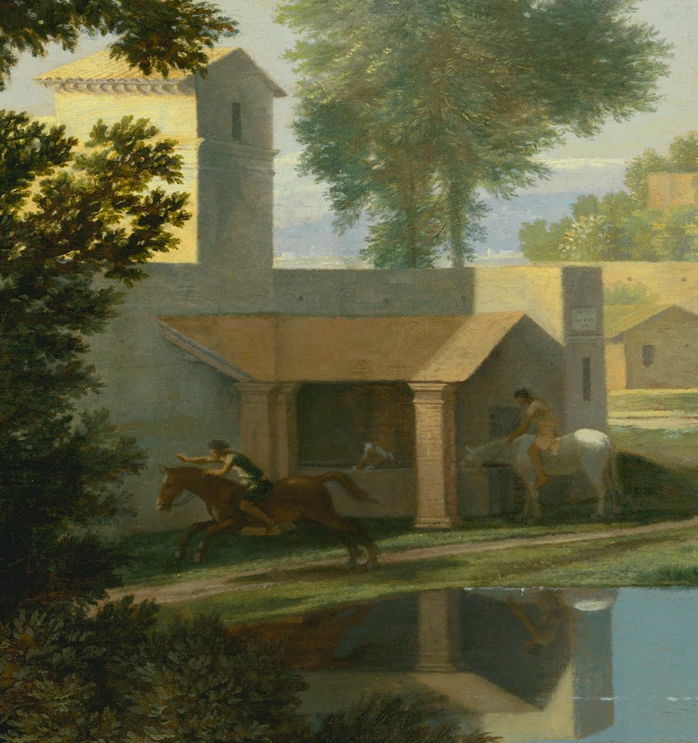 In front of them, one horseman rides away at a full gallop, another remains on his horse whilst it drinks at a trough under a portico against the building. The surface of the lake is mirror-like, reflecting the cattle and villa behind, and blue sky, with scattered white ripples in parts. At the back of the lake a flock of sheep and herd of cattle are packed close together, strung along the water’s edge of the far shore. They are tended by two men, one of whom is playing bagpipes. Behind the cattle are the earthworks and walls of a large Italianate villa, rising four storeys and more in parts, and with a section of high crenellated top. A park within the walls is rich in trees, and another, inner wall is part-lit brilliantly by sunshine. A few people are walking in front of and behind the boundary wall. Behind and to the right of the villa is a low hill (at the right of the picture). At the left foot of the hill a fire burns bright flames, its smoke wafting erratically up into the air, in the calm. In the background the land rises more vigorously to high wooded hills, then ascends to angular impending rocky mountains which appear to nestle in the clouds. Towns and hamlets cluster on the slopes in the far distance. To the left of the villa is a glimpse of a more distant range of snow-clad mountains with wooded slopes below, and scattered buildings. This painting has a curious history. Although documented at the time as being one of a pair (the pendant being The Storm, or Landscape with a Storm), this work was misattributed to Gaspard Dughet until about 1977. The pendant was also lost until it re-appeared, rather the worse for wear, in 1950. Sadly, whilst Calm is at the Getty, Storm is in Rouen, so you are not likely to see them together as was intended. Nicolas Poussin was born on 15 June 1594 near Les Andelys, a village on the River Seine in Normandy which in the late nineteenth century was a popular location for Impressionist painting. He ran away to Paris at the age of eighteen, where he started his apprenticeship as a painter. He settled in Rome in 1624, and remained there painting for most of the rest of his life, until his death there on 19 November 1665. A good friend of the other major French landscape painter of the day, Claude Lorraine, he relied mainly on private patronage and completed many major paintings with religious and historic themes. He returned to France between 1640 and 1642, following which his work became increasingly dominated by landscapes. After 1650 painting became more difficult because of worsening tremor in his hands, but this did not stop him completing a quartet of the Four Seasons between 1660 and 1664. His marriage was childless, but he adopted his wife’s brother, Gaspard Dughet, who painted fine landscapes. 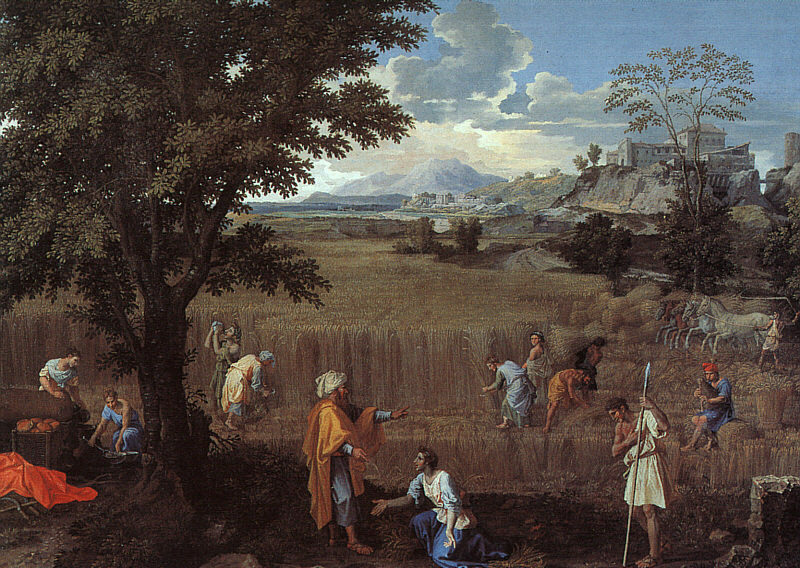 Nicolas Poussin, Summer, or Ruth and Boaz (1660-4), oil on canvas, 118 x 160 cm, Musée du Louvre, Paris. WikiArt. In Northern Europe, pioneer landscape painters such as Joachim Patinir (and Dürer) had started to establish the genre in the early sixteenth century, but the South had been more reluctant and emphasis there had remained on religious works. Poussin and Claude together helped establish landscape as an honourable genre throughout Europe, although recognition was still slow, and it was not considered a match for history painting or portraiture. Poussin’s own gradual journey to landscape is fascinating, and despite several of his later works being relatively pure landscapes, most still contain a reminder of a religious or mythical narrative, as if he could not quite let go of that tradition. Indeed his last great works, the Four Seasons, link to Biblical scenes, despite being magnificent landscapes in their own right. 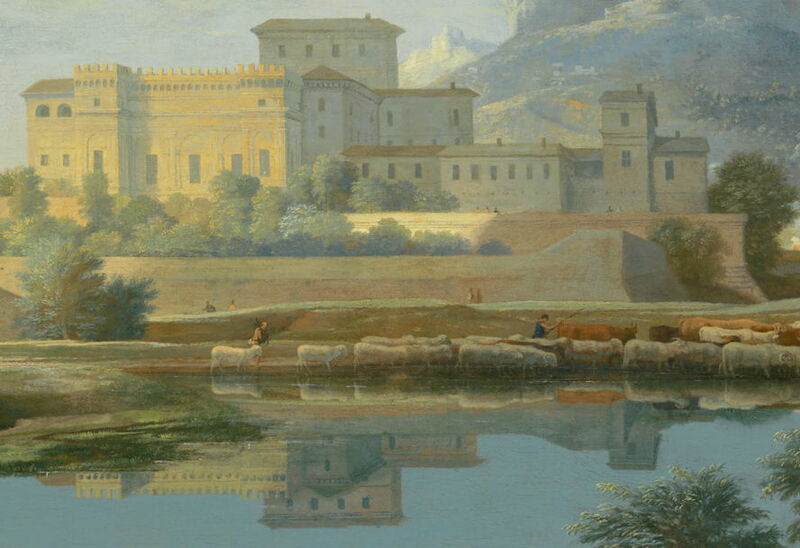 Unlike many of the Northern landscapes (compare Vermeer’s View of Delft of 1660-1, for example), Poussin’s are idealised fictional motifs, composites formed in his mind from the extensive sketches and studies that he made in the Roman Campagna. Many of Poussin’s plein air and compositional drawings are held in private collections, including the UK Royal Collections, or kept away from his paintings, and many were inevitably lost or destroyed. Most recently Poussin has been cited by several radically different painters, from Cézanne onwards, as their inspiration. In Cézanne’s case it is not clear how he intended to repeat Poussin “after nature”, given the quantity and quality of Poussin’s drawings from nature. One of the difficulties and pleasures with the elaborately detailed landscapes of Poussin is distinguishing any ‘meaning’ in the many elements that make up the motif. Are the horsemen here mere staffage (decorative objects used to populate a landscape), are they symbolic, or part of some narrative or allegory? Given Poussin’s long experience in incorporating such meaningful elements, it is very hard to know. Obvious indicators which would imply that they may have meaning of their own include whether they are unexpected, much like the man killed by a snake in another of Poussin’s paintings (see Clark), or whether they contain visual cues that reference known narratives. Ever since Poussin’s paintings have been visible to the public, there has been speculation as to their inner or hidden meanings. Perhaps the most fertile for imaginations has been Et in Arcadia ego (1637-8), named from the Latin inscription visible in the painting, and meaning ‘even in Arcadia, there am I’. 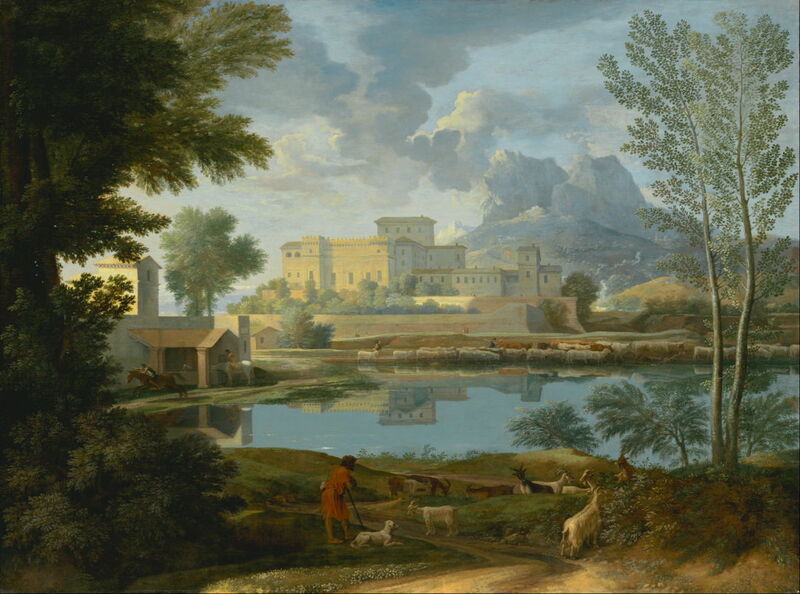 Landscape with a Calm contains several features which could form part of an allegory or narrative. These include the animals and the people tending to them, the fire in the distance, and most immediately the horsemen. Groups of goats, sheep and cattle, and those tending them, are quite usual in such pastoral scenes, and there is nothing to suggest that any of the three groups of animals here is out of that ordinary, or holds unusual significance. 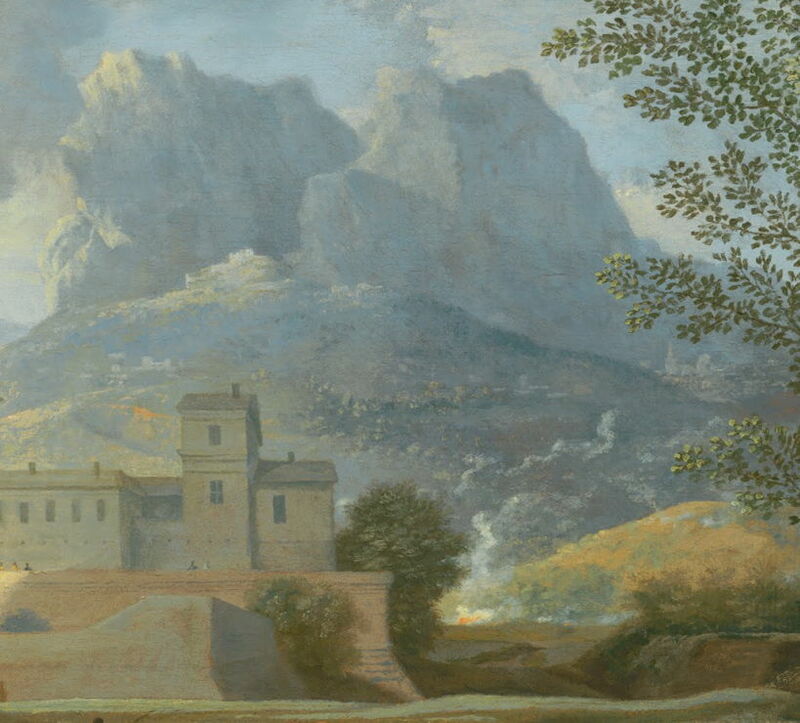 Fire is often taken as an indication of destruction (and Poussin did make a castle on fire a prominent feature of another of his landscapes), but again is not out of the ordinary, and may just have been used to add a visual cue to the appearance of calmness and serenity. The fire here is not threatening. Horsemen would also have been a common sight around villas of this type and era. However the clear urgency in the rider heading off to the left of the painting, at a full gallop, does appear to warrant more explanation. But we can only speculate whether this would have meant more to Poussin’s client, a Paris banker and silk merchant, as there are precious few clues for us. In a painting of great serenity, the galloping horse is a stark contrast. This painting is one of Poussin’s finest, and is one of his purest landscapes, lacking any overt reference to history or myth. It is thus a landmark in the history of painting, and as aesthetically rewarding as any painting of its time, in a quiet, serene, and calm way. Although out of fashion at the moment, there is still a rich literature and other resources. Alain Jaubert, Palettes DVD: Le grand siècle Français, Admirable tremblement du temps, Editions Montparnasse. (A complete 28 minute programme in this superb series, covering the Four Seasons.) Details. Posted in Painting and tagged allegory, Anthony Blunt, Claude, landscape, Poussin. Bookmark the permalink.